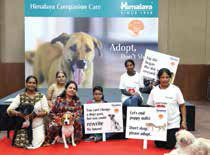 The Himalaya Drug Company has organised a pet adoption drive ‘Build a Bond’ in Bengaluru. Committed to supporting this cause, the event witnessed over 165 furry friends along with their pet parents. The event was addressed by Neti Patel, Business Head – Animal Health Products, The Himalaya Drug Company; Dr Ritesh Sood, a veterinarian and Marketing Manager, Himalaya Companion Care; and canine behaviourist Anand Vishwanathan, urging the audience to consider adopting pets rather than buying them. A walkathon with dogs was organised as part of the ‘Build a Bond’ initiative.